These weathered, utilitarian structures have a unique beauty and are quickly disappearing from the prairie landscape. They are being replaced by more efficient modern structures. Sadly, there goes part of history. On a prairie drive their distant silhouette brings picturesque relief from the vast flat areas. Standing proudly they announce grain and farming activity in the area. 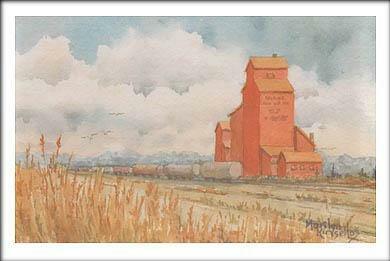 Although this scene is a composite and not of a specific area, I chose to paint the elevators in bright orange and yellow, with a big prairie sky, grain cars, some foreground wheat and (of course) the mountains in the far distance. It could be many places.